You are here: Home / Galaxy Note 5 How-to Guide / How to use app folders on Galaxy Note 5 home screen? Use app folders to organize apps on Galaxy Note 5 home screen. How to create app folders?how to delete app folders? and how to add apps to app folders on Galaxy note 5? This guide answers. What is app folders on Galaxy Note 5? Why you need app folders on Galaxy Note 5 home screen? When you get your Galaxy Note 5, there are about 30-50 (the exact number depends on region and carrier) apps pre-installed by Samsung and your carrier. You will surely install more apps. So, it is not uncommon that there are more than 200 apps in most Galaxy Note 5 phones. To use these apps, you can put a shortcut to Galaxy Note 5 home screen so that you can access them quickly without navigating to Galaxy Note 5 apps screen. Now, the problem is how to put so many apps on Galaxy Note 5 home screen. You need so many home screen panels (pages) if you do not use app folders on Galaxy Note 5 home screen. Another problem is how to locate the apps quickly if you have so many apps. Although Samsung removed the limit of the number of home screen panels in Galaxy Note 5 home screen, you have to consider how to access them conveniently. It is not wise to swipe 10 times to find the app. The solution is to use app folders on Galaxy Note 5 home screen to keep your apps organized. With app folders on Galaxy Note 5 home screen, you can organize apps based on vendor (e.g., apps from Google or Amazon) or function (e.g., apps for photo editing, apps for document editing, games…) or other criteria. One app can be in several app folders on Galaxy Note 5 home screen. For example, you can put Google Photos in the Google apps folder, and in the Photo editing app folder simultaneously. In short, app folders on Galaxy Note 5 home screen let you use Galaxy Note 5 more efficiently. You will enjoy to use these apps because you can locate the apps easily. How to create app folders on Galaxy Note 5 home screen? 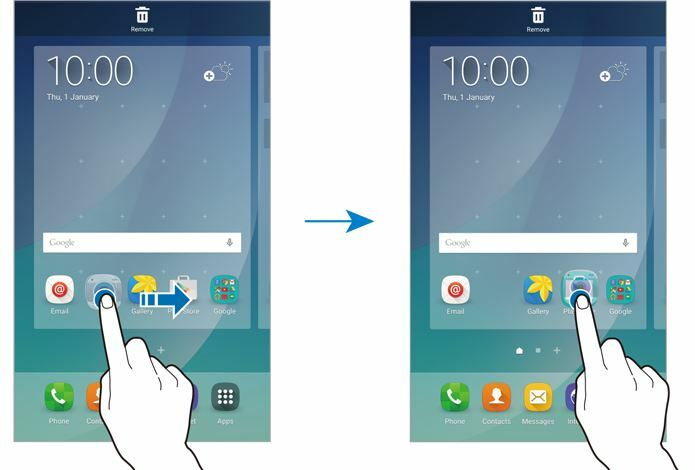 To create app folders on Galaxy Note 5 home screen, you may follow these steps. Step 1: Tap and hold an app icon in the home screen. You may check this guide if you are not sure about Galaxy Note 5 touch screen gestures. Step 2: Without releasing your finger from the screen, move the app icon over another app icon as shown below. Step 3: Once you see the a folder frame around the apps, release your finger from the screen to drop the app and create the app folder for these two apps. Step 4: Name the app folder. You can give the app folder a meaningful name so that you can easily locate the app in this folder. Step 5 (optional): Change the background color of the app folder. Tap the color palette to change the background color for the app folder. How to move app folders on Galaxy Note 5 home screen? Once an app folder is created, you can move it to any other locations on Galaxy Note 5 home screen, just like an app. To move apps folders on Galaxy Note 5 home screen to a new location, just tap and hold the app folder, move it to the desired location, then release your finger to drop the app folder to the new location. How to add apps to app folders on Galaxy Note 5 home screen? You can add as many apps to an app folder as you want. But it is better no to add more than 9 apps to one app folder on Galaxy Note 5. If you add 10 or more apps to one app folder on Galaxy Note 5, you will have to scroll down to access the 10th onward app. So, keep the number of apps in one folder up to 9. If you want to put more than 9 apps to that app folder, you may consider to create another folder for these apps. To add apps to app folders on Galaxy Note 5 home screen, tap and hold the the app icon, and then drag it to the folder. Please note, one app can be added to several app folders on Galaxy Note 5 home screen simultaneously. How to remove apps from app folders on Galaxy Note 5 home screen? If an app is uninstalled, it will be removed automatically from app folders. If you want to remove an app manually from an app folder, you can tap the app folder, tap and hold the app, move it outside of the folder, or move it trash can. Please note, removing an app from home screen only removes the app shortcut from the screen. The app is NOT uninstalled. You can always add it back to the home screen later. How to remove app folders from Galaxy Note 5 home screen? To remove app folders from Galaxy Note 5 home screen, tap and hold the app folder, then drag it to the trash can on the top of the screen. Can I add app folders to another app folder (i.e., nested app folders) in Galaxy Note 5? No, you cannot add an app folder to another app folder in Galaxy Note 5. In other words, Galaxy Note 5 does not support nested app folders. Can you use app folders on Galaxy Note 5 home screen now? If you have any questions or encounter any problems on using app folders on Galaxy Note 5 home screen, please leave a comment in the comment box below. I am trying to create a folder on my home screen with my Note 5. It just keeps swapping places with the app that I’m trying to create the folder with. I was able to do it previously I had to do a factory restore and no I cannot create a folder. Is there another way to do this? Any help is greatly appreciated! You need to drop the app over the destination app. Notice the screen feedback before dropping. You can also create app folder in apps screen, then add the app folder to home screen. After this, you can edit both app folders independently. I understand how to create and use folders on the home screen of my Note 5. Everything was fine until I wanted to create a folder containing webpages in order to have easy access to gift ideas. I wanted the product page so I could read over customer reviews, product info, etc. at my leisure. I created the folder and added the pertinent shortcuts. My issue is with aesthetics. I have this need for a space to be symmetrical and pleasing to the eye. Is there a way to change appearance of the folder or somehow add an image in the form of an icon. I know this sounds trivial, but every time I see my home screen it irks me. The folder stands out like a sore thumb. It will bug me until I figure out how to fix it, or until I have exhausted all avenues and know there is no solution available. My apologies. Please overlook my rudeness. I was rushed towards the end of my comment and forgot my manners. Thanks you for writing such a detailed post. It was clear and concise. As I know, unfortunately, you cannot customize the folders except changing the background color in the default launcher. Some third-party launchers may allow more customizations. But I cannot recall any that can meet your expectations. Where is this feature (“+” button to add more apps to this folder) in Note 5.. Why it is not available !! Note 5 doesn’t use + button to add apps to app folders on homes screen. You just tap, hold, move the app, then drop the app to the folder. If you are talking about app folders in apps screen, you need tap the EDIT button, them move the apps similarly to any app folders. it is gone. you have to move them one by one after tapping EDIT button. when I try tout create a folder on any page besides the first home page the app just switches places with the other one. Very annoying. Just practice and be patient. Why can’t I delete an app? And I can’t drag to another app to make a folder! If you want to delete the app from home screen, tap and hold the app, then you can see the delete icon in the top. Without releasing your fingers, drag the app to the recycle bin top remove it from the home screen. To uninstall an app from your phone (from apps screen), there are many methods. In settings – applications – application manager, you can uninstall it disable apps. For creating app folders, you need follow the guide. Which PDF app? You can use My Files app to manage files on your Note 5. I don’t know about Michael, but this just happened to me after a reboot. Got my phone on Monday and have been setting it up all week. Today was my first time actually rebooting the device, and now all of my folders were gone. At first only 2 apps showed up so I rebooted again. Now all my apps are there, but not in any of the folders I had created, and all of my short cuts on task bar (not sure what else to call it) on the bottom of my home screen are gone. Only the apps button is there. I’ve had Samsung devices for years and never had this happen – really frustrating, took a lot of time to organize all my apps the way I wanted them and now I have to start all over. The missing apps or app folders was reported after using safe mode. The workaround is to switch to easy mode, then switch back. Switching to third party launcher then switching back may also solve the issue. But the issue was fixed in recent updates as I know. You may check whether there are any updates for you in settings – about device- software update. It just happened again, after a month of no problems. It happened after a reboot just like before, and there are no updates pending. I tried switching to easy mode and back as well, and still no dice. After the initial reboot, none of my apps were listed at all. I rebooted again and they are all back, but not in any of the folders I had created. So damn annoying. Not sure. In most regions the issue was fixed already. You can install Google Now launcher, switch to it. Then switch back to see whether it helps.